dbclunie: Video : NINJAFLEX Filament - Its Stretchy and Flexible! Video : NINJAFLEX Filament - Its Stretchy and Flexible! 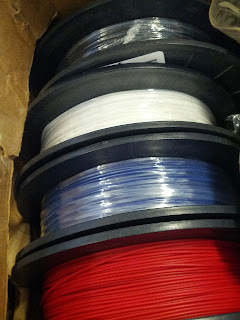 from the looks of it will give the makerbot industries "flexible filament" a run for its money, literally since the Ninjaflex is $50 for .50kg spool vs makerbots flexible filament whic run you $130.00 for 1 kg spool! A 30 dollar difference! Also ninjaflex is supposedly supposed to function just like ABS so printers like my replicator 2x, in theory, should be able to print this filament with ease, while the makerbot flexible filament is only rated to print using the replicator 2, as it maybe PLA based, similar to makergeeks.com ecoflex PLA filament. A third consideration that would put the Ninjaflex filament into the lead is the color choices. Right now makerbot flexible comes in only white. Ninjaflex comes in as you can see, Black, White, Blue, and Red. This stuff is very, very, interesting. Check out the video below to see how flexible and stretchy it is.